A game for Ludum Dare 39, with theme "Running out of Power". 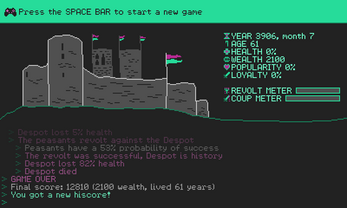 You play as a despot whose power is waning, and the goal is to accumulate as much wealth as possible and survive for as long as you can. 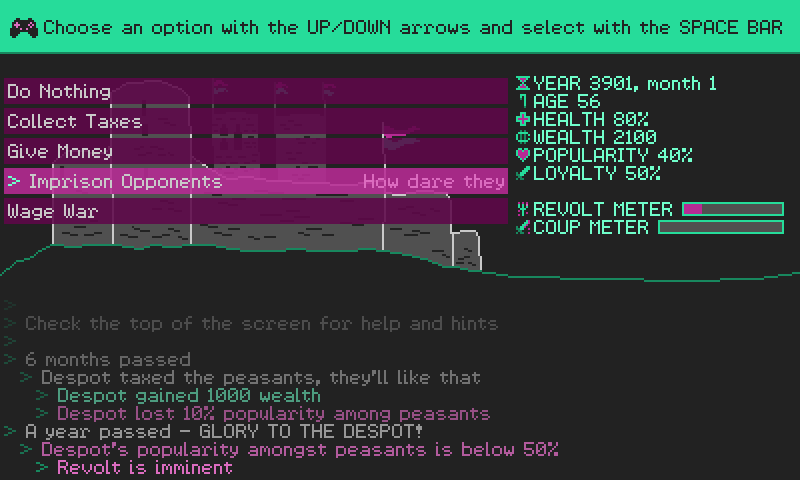 As despot, you interact with two factions that don't like each other: peasants and nobles. You choose an action to perform every turn. Year: Each turn advances 6 months. 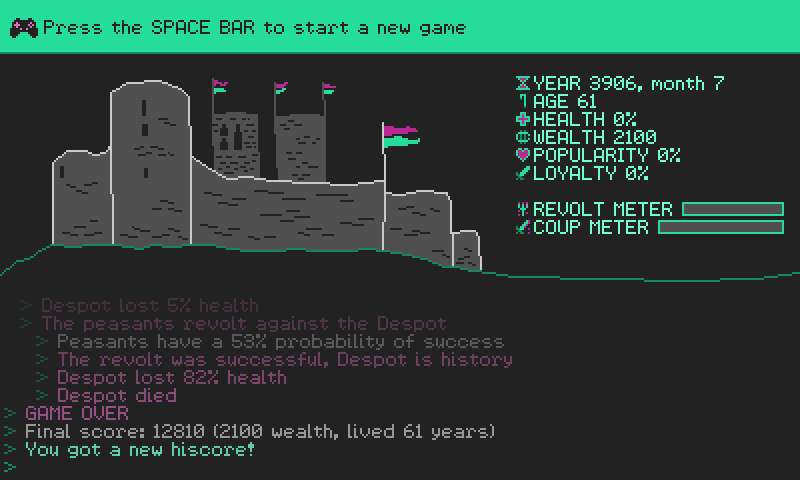 Age: Despot loses health points every turn after the age of 60, and faster every decade past. Health: Game ends when health drops to 0. Wealth: Final score is Wealth * Age / 10. Popularity: The percentage of peasants that are on the despot's side. Loyalty: The percentage of nobles that are on the despot's side. 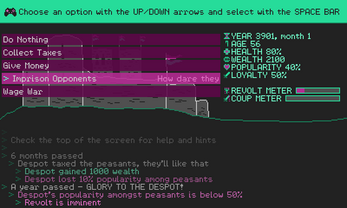 Revolt Meter: When full, the peasants launch a revolt against the despot. Starts the count once popularity dips below 50%, and increments every turn with no way to stop it. Coup Meter: When full, the nobles stage a coup against the despot. Starts the count once loyalty dips below 50%, and increments every turn with no way to stop it. Do Nothing: Recover health points at the expense of loyalty and popularity. Collect Taxes: Take money from either peasants or nobles, at the expense of popularity or loyalty, respectively. Give Money: Give money to one of the two factions to appease them, to the other's ire. Imprison Opponents: When the Revolt or Coup Meters start to worry you, round up the ring leaders to stave off the inevitable. Need over 50% of the other faction's support. Wage War: A gamble with large rewards in case of victory and large losses in case of defeat. Incurs some losses even if victorious, if popularity is under 33%. Hello, can you post a link to the game's LD jam page? Can't find it anywhere.